Food Wishes Video Recipes: Happy New Year! It's 2000 and Ate! Happy New Year! It's 2000 and Ate! I want to wish you all a very happy and healthy New Year! May your 2008 be filled with lots of delicious food, and many memorable meals. Sorry I don't have a black-eyed pea recipe video to go along with this cool photo, but hey it's New Years Day, and my last "day off" for a while. 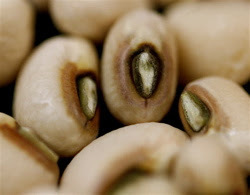 As many of you may know, black-eyed peas are a very traditional New Years day meal in the American south. It's usually served with greens, which represents money and prosperity, while the peas represent all the good luck you're going to have in the year to come. So, here's to lots of greens and peas in 2008. Enjoy! Right back at ya, Chef John! Happy New Year Chef John! We used to have some nice roast dish or a home-smoked ham - and it wwas always served with lentils in our family, as the New Years Day meal. Lentils = lots of money in the new year of course. Happy new year to you Chef John! Two thousand and ate, sounds like eight! No editing needed, just some imagination. Is a Case of "Plantain Envy" Driving You Bananas?